Everyone loves this Mediterranean style villa from the moment they step inside. One of just a few villas on the North Coast that truly inspire, it was Re/Max Coral Bay realty who originally sold this villa to its current owners and they have now asked me to list it again. Inspirational, charming, delightful. Qualified buyers will be as taken in by the beauty of this villa as I was and indeed I still am, every time I have the good fortune to visit. The master suite is huge taking up the entire second floor and includes a massive king size bed, delightful bathroom with a walk-in shower that includes rain fall shower heads, a huge entertainment room with massive couch / daybed and an outdoor terrace with open air jacuzzi. The detached second master suite is on the ground floor and guests have a small prvate terrace and easy access to the pool deck. The third and fourth bedrooms are both en-suite and are situated in the main house. The kitchen is a cooks dream with modern stainless appliances, granite counter tops, breakfast bar and a central cooking island. Both the living and dining areas lead out to the terrace and the pool deck. 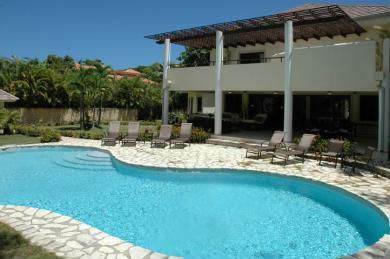 Not to be missed, this property represents a fabulous opprtunity to invest in a Dominican home of superb quality and unforgettable charm.